Coding Curriculum for Ages 4-16 led by ex-Microsoft Engineer! [01.04.2019] Enroll for 2019 Summer Camps now! Enjoy early-bird offer before Apr 30! [13.02.2019] Enroll for 2019 Easter Camps now! Enjoy early-bird offer before Feb 28! [01.01.2019] Sign up for 2019 CNY Camps now! Enjoy early-bird offer before Jan 25! [20.12.2018] 2019 Jan - Mar Regular Courses are enrolling now! Digital transformation is upon us. At Cobo Academy, our mission is to empower your child to become future ready through early exposure to coding, robotics, AI and more! 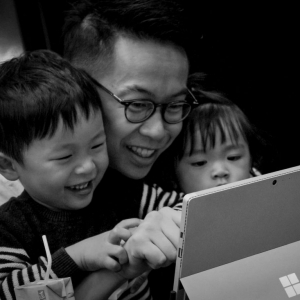 Founded in Hong Kong by tech veteran and ex-Microsoft Engineer Harris Chan, we are a fun and dynamic team of tech leaders, entrepreneurs, educators and parents who share the same passion and vision for the future of technology. Our curriculum is developed through extensive study on globally acclaimed Computer Science programs to develop your child’s ability to think and solve real-world problems. 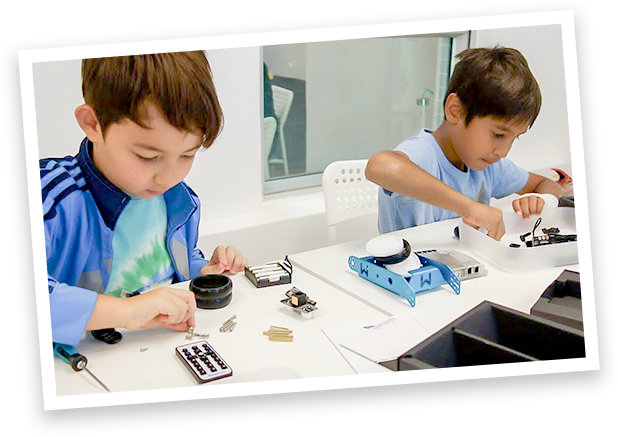 Designed to augment formal education, our certificate regular term courses, holiday camps and STEM workshops are tailored to give young tech enthusiasts aged 4-16 a head start into the future. FUN is guaranteed! Coding, robotics, AI, and more! Comprehensive programs for every kid aged 4+. 5 day camps designed to make holidays fun and exciting! Then dive deep through our regular term courses. Experience our passion at our flagship campus in Wan Chai and be inspired by tech leaders & entrepreneurs! Bespoke team-building activities tailored for corporates and for kids at all tech proficiency levels. Empower our next generation to become future ready through early exposure to coding, robotics, AI and more! Self-driving cars, Siri and AlphaGo are just a few examples of how AI and Machine Learning is transforming our lives. Software and robots are increasingly more capable of handling tasks previously carried out by humans, and this is just the beginning! To many, technology presents a huge challenge to the human race; to us at Cobo Academy, we see unprecedented opportunities for our next generation to thrive. As parents, we understand the importance of learning English and Mandarin at an early age. In the digital economy where every company is a software company, coding is the new language of technology every child should master. Whether or not your child aspires to be an engineer, early exposure to coding develops their logical problem-solving skills, unleashes their creativity, and empowers them to freely express themselves. 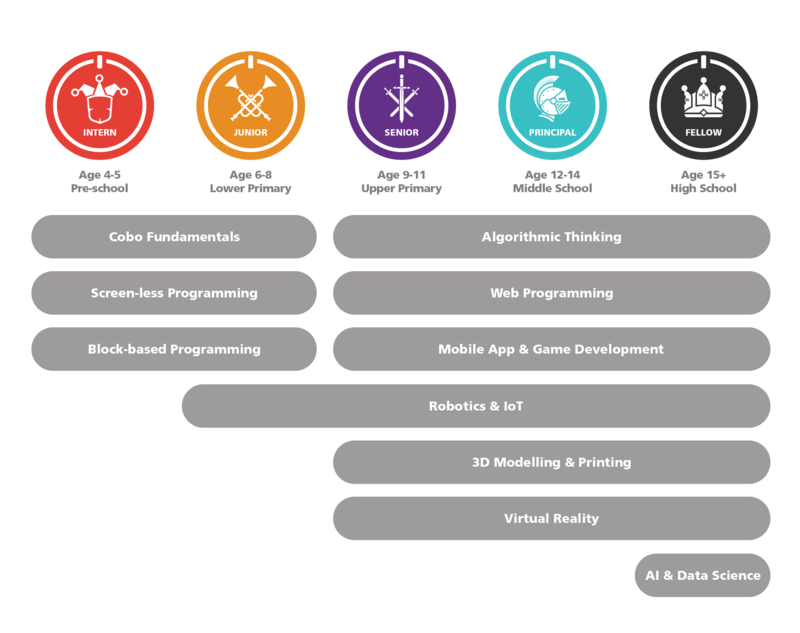 Our innovative curriculum is designed to augment formal education and is the collective brainchild of experienced coders, educators – many of whom happen to be parents! By embracing problem-based and project-based learning, we develop timeless core skills for present and future: Digital Literacy, Critical Thinking & Problem Solving, Creativity and Collaboration. Your child is unique! Using small class (typically between 4:1 to 8:1) teaching, student learning is optimized to their needs and their pace. Our instructors share the same passion for children and technology, and are trained to explain rocket science in paper airplane terms! Every session is FUN and interactive, encouraging our students to freely express themselves and unleash their inner curiosity. We are a dynamic team of veterans in tech and education who share the same passion and vision for the future of technology. We wake up every morning thinking about how we can transform education to cultivate future creators. "Witnessing my own children grow and acquire new skills gives me joy and satisfaction beyond words. Cobo Academy is a pursuit of my vision to inspire our future generation to unleash their potential and creativity." As a tech veteran, Harris is fascinated by how technology is transforming our world and what it means to our future generation. Born and raised in Hong Kong, Harris received his primary and secondary education from La Salle, and graduated from the University of Washington in Seattle with a degree in Computer Science. His career began as a software engineer at Microsoft headquarters in Redmond, Washington. Harris also held senior leadership roles at Yahoo! Hong Kong as Head of Business Development and Director of eCommerce. 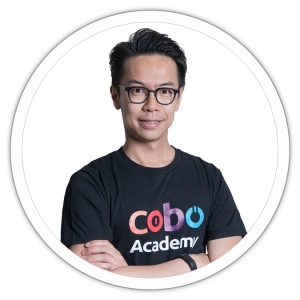 Prior to founding Cobo Academy, Harris was the Director of Central Marketing Organization at Microsoft, in charge of commercial and consumer marketing in Hong Kong. Outside of work, Harris loves spending time with his family and inspiring the growing minds. He was a Microsoft "Hour of Code" Instructor, Business Advisor for Junior Achievement Hong Kong, Programming Consultant at University of Washington and CyberCamp Instructor in Seattle, Washington. Come experience our passion and be inspired by tech leaders & entrepreneurs! Customized ECAs for schools from lower primary to high school. Build your first App in 5 days! Then dive deep through our regular coding courses. Coding, robotics, AI, and more! Full curricula for every kid aged 5+. From Pre-schoolers to High Schoolers, from beginners to geeks, we have you covered! Our Regular Term Programs are designed to augment your child's school education and will never stop evolving to stay ahead of the latest trends! Fun Tidbit: Our program names - Intern, Junior, Senior, Principal and Fellow are inspired by the engineer ranks used by elite technology companies such as Google and Microsoft. We are a non-profit organization. Our goal is to provide every individual with special needs the support, friendship and inclusion that they deserve. The term Special Needs is a short form of Special Education Needs and is a way to refer to students with disabilities. The term Special Needs in the education setting comes into play whenever a child's education program is officially altered from what would normally be provided. More narrowly, it is a legal term applying in foster care in the United States, derived from the language in the Adoption and Safe Families Act. It is a diagnosis used to classify children as needing "more" services than those children without special needs who are in foster care. In the United States, special needs is a term used in clinical diagnostic and functional development to describe individuals who require assistance for disabilities that may be medical, or psychological. For instance, the Diagnostic Statistical Manual of Mental Disorders.